Phong Nguyen’s bio is as complex as his writing. He didn’t follow the straight, traditional literary scholarly path many follow. 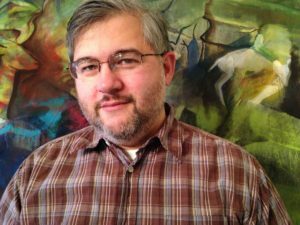 While he currently teaches at the University of Central Missouri and serves as editor for the esteemed Pleiades journal, he left college early on, moved around the country, and lived for a time in a 100-year-old cottage heated by a wood stove. It was reading Proust’s Remembrance of Things Past that put him back on the academic path toward a writing degree. Nguyen’s first story collection, Memory Sickness, won the Elixir Press Fiction Award. But it’s in his second story collection, Pages from the Textbook of Alternate History, that Nguyen’s ability to take on the voice of famous historical characters begins to blossom. Then with his first novel, The Adventures of Joe Harper, that uncanny ability to combine history and believable characters and dialog is fully realized. Nguyen’s father immigrated from Vietnam to the United States in 1962. Nguyen, who grew up in central New Jersey, currently lives in Missouri with his wife, Sarah, and their three children. An artist, Sarah created the vibrant cover painting for Joe Harper, which begins in 1871, about 20 years after The Adventures of Tom Sawyer leaves off. It follows Joe, one of Tom’s “bosom buddies.” While it’s a remarkable continuation and ode to Twain’s boyhood series, it’s a novel that stands utterly on its own merit. Tara Lynn Masih: First off, congratulations on The Adventures of Joe Harper. It’s an extraordinary undertaking that you executed brilliantly, even garnering praise from Pulitzer Prize winner Viet Thanh Nguyen. I’m curious what lead you to the idea of continuing the story of one of Tom Sawyer’s friends, Joe Harper. Did you at any point worry about emulating the voice and vision of Mark Twain, one of our greatest American writers? Phong Nguyen: Thank you for the congratulations, and your kind words about the book. The epigraph of The Adventures of Joe Harper really was the genesis of the project. “As the two boys walked sorrowing along, they made a new compact to stand by each other and be brothers and never separate till death relieved them of their troubles.” I started out thinking it would just be another short story—I had previously only written short stories after all, and I knew roughly the shape I was striving towards from the beginning. But then the voice of Joe Harper really took hold and wouldn’t let go. I realized soon after that the scope of the project was much larger than I initially thought. As far as worrying about emulating nineteenth-century Pike County dialect, I comforted myself by coming up with the dedication very early on in the process: “To Mark Twain, who, though I stand knee-high to his genius, would not, I believe, try to shake me off his leg.” The thought of Twain being amused by what I did with his characters in this book, even if it did not conform to his vision, seemed more likely than outrage or indignation, from my understanding about Samuel Clemens the man. I love the idea of you thinking of Twain being amused by you extending his reach, so to speak. I’m sure he’d have approved and said something very clever back to you! So what was it about the novel Tom Sawyer that inspired you to adopt one of its characters and spend more time with him? And tell me about that experience of Joe’s voice taking hold and not letting you go. Is this the first time that’s happened to you as a writer? Well, even though the epigraph is from The Adventures of Tom Sawyer, it was The Adventures of Huckleberry Finn that was my real influence. It’s a book that I discover new things about every time I read it (and I read it at least once a year), and it has one of the most complex and surprising endings in literature, in my opinion. The greatest challenge in writing the book Joe Harper was devising an ending that even approached the intricacy of Huckleberry Finn’s ending. As far as the experience of Joe Harper’s voice taking hold and not letting go, this was the most powerful and enduring example of that phenomenon for me as a writer, but it must be said that I usually begin a story with a character’s voice. Actually, that was going to be my next question. I’m a huge fan of Twain and Huckleberry Finn myself, and noticed your plot mirrored more this Twain novel. Your characters (like Huck and Jim) are also on an Odyssean land voyage, and you tackle similar issues of race (and sexism) by giving Joe two very interesting companions, Lee, the Chinese railroad worker, and Ruth, the Amish runaway bride. All framed within postwar hobo culture. You say in your bio that you’ve had some harsh experiences with racism yourself. How did that, and your exposure to the writings of Gandhi and King Jr., influence your desire to tackle these loaded issues? The greatest influence on my desire to tackle those issues came from Twain himself. He wrote several articles for Galaxy Magazine, and a chapter in Roughing It, that defended Chinese immigrants from the racism and persecution that they experienced in the West, specifically in San Francisco. As I understand it, the reason he was fired from the San Francisco Call was that he wrote an article critical of the Irish laborers who abused Chinese workers, and called out the San Francisco police for ignoring these crimes. The editor, George Barnes, knew that his readership was primarily Irish, and didn’t want to put off his readers by defending the Chinese, so he refused to run the article, which would eventually lead to Twain’s dismissal from the Call. As far as how my own experience informed my desire to write about racism, it was largely a response to constant negative portrayals of Asian Americans in popular culture. Every Asian American man and woman I know has dealt with a lifetime of negative stereotypes and portrayals in mainstream culture. The times in my life where I may have encountered racism directed at me, I have tended to chalk it up to ignorance. I don’t resent the person espousing racism, but I blame the cultural context that shaped their ignorant response. As an artist and as a minority, I feel as though it is a part of my function to portray characters who are nuanced and defy expectations, as Lee for example turns out not to be the “sidekick” to Joe, but in fact the protagonist of his own story. I was unaware of Twain’s role in trying to effect change beyond his novels. It makes me a bigger fan, knowing the risk he took to speak up. In your novel, I appreciate the strong, intelligent, worldly Chinese immigrant, or “Chinese Tom Sawyer,” as Joe calls him, that you created. In some respects, Joe is a mirror you hold up to society. We view through his eyes the outside world, specifically his initial bias and then growing respect for Lee. I’m curious about your choice of an Amish female sidekick as well. How did Ruth’s character develop? And what would she think of today’s #metoo movement and increase in women running for political positions? Ruth’s character arose partly out of my wish to bring a complex female character into Twain’s world, which is predominantly male. As you can see in the book, Joe Harper himself has a simple, even dismissive, attitude towards the women in his life. Even his infatuation with Ruth blinds him to her authentic qualities. One of the challenges of writing her character was suggesting her independent life and character even as she is seen through Joe Harper’s eyes as the narrator. The other part of my reason for writing Ruth into the story was my fascination with the Amish way of life, and the research involved with that. As far as what Ruth would think of the #metoo movement and women running for political office, I would think that as a product of the mid-nineteenth century she would be very surprised and even confused by the changes in the last 150 years or so, but ultimately I imagine she would feel validated in wanting so badly herself to step out of the social expectation that she will marry a husband chosen by her community. She fiercely pursues her own independence, and I have to think she would be proud of these developments, perhaps even pursuing public office herself! Yes, I enjoyed seeing a strong female character and I appreciated the twists and turns in her journey. That’s all I’ll say so I won’t spoil it for readers. You mention research, which leads me to the next question. In an earlier answer, you discuss having to “emulate” nineteenth-century Pike County dialect. This novel must have been a huge undertaking, if for no other reason than it required an enormous amount of detailed, intense research. For writers who are working on historical fiction, give us some tips on how you went about doing your research and how you kept it organized. Did you face any research challenges? Research is and always has been an essential part of my writing process. Some people write from life, others from dreams — I write from research. That said, I have to work hard to make sure I don’t get carried away with the research and forget what is important, which is the story at hand. For Joe Harper, my research concerned four areas: Pike County dialect, early hobo culture, post—Civil War America, and the Chinese American experience in the late nineteenth century. There were other areas that I spent time on, such as Amish history and the details of, for example, Kansas City history, drug use in the 1870s, and vaudeville, but mostly my time was spent on the four areas I mentioned above. My organization was not my strong point, but I would do copious research on hobo culture, then write the section immediately afterwards so it was fresh in my head. The biggest research challenge was that most books on hobo culture are about the 1930s, and I was writing about the very earliest hobos, before hobo writing and widespread hobo culture. There were only two books, I think, that concerned the early days of hoboing, one of which was Jack London’s The Road. What you’ve done is very impressive, and if you had to improvise, you pulled it off. They are very convincing hobos. I also want to compliment you on your descriptions of the natural world. That is something that drew me to Twain’s writing as well. Your own descriptions are more lush. I flagged many passages in appreciation, but one about nature itself stands out for me: “The products of nature might be there to serve our senses and affirm a Lord who could make such things as stars or oceans or egrets, or it might obey its own prerogatives, but either way . . . , what it amounts to is a world beautifully fatal or fatally beautiful.” You aren’t just a skilled writer, you’re a wise one. That’s not really a question, more of a comment, so tell me about your view of setting in literature, and how you applied it to this book. Twain spends more time describing the Mississippi River than he does with any other setting, object, or character in Huckleberry Finn. The effect of that copious description, for me, is to read the Mississippi River as larger than a mere “theme” — as the very definition of a free life, and as the narrative contrast to every trouble they encounter on land. As much as Twain loathed the Romantics, his reveries about the river approach the Romantic sublime. So setting is used here as a contrast to this climactic moment in the story, as the unlikely stage for a manhunt. Elsewhere setting is used to suggest the monotony of life on “the road” (such as in Kansas), or to convey a feeling of claustrophobia (such as in the ghost town), or to reveal the dangers of “the life” (such as the tornado scene). I view setting as a tool that can be used to a variety of different ends, and I try to apply it widely. Well, it’s finely constructed and beautifully written. I hope it’s read widely. So, where do you go from here as a writer? Was there a letdown after you finished? I can imagine it was hard to let go of these characters. Have you found another challenge that will absorb you as much as this novel did? It was indeed hard to let go of these characters. I actually started to write a spin-off of this spin-off about Lee and Ruth, but then I became interested in two other projects that have engaged me, one of which is finished and being shopped around at contests, and the other of which is still in-progress. The finished project is called Senior Skip Day, and it is a series of stories written in the voice of high school essays about canonical poems (very much inspired by Eric Puchner’s story “Essay #3: Leda and the Swan”). The work-in-progress is called The Bronze Drum, and it is a novel about the Trung Sisters, who are national heroes in Vietnam (similar to the status of Joan of Arc in France) because in the year 40 CE they raised an army of 80,000 women and resisted the Han Chinese occupation of Lac Viet lands, reigning as queens for three years before China sent a massive army led by their fiercest general Ma Yuan, and overwhelmed the Lac Viet people. According to the national Vietnamese narrative, the Trung Sisters then committed suicide by jumping into the Red River and drowning; and according to the contemporaneous Chinese account, the Trung Sisters were caught and beheaded by Ma Yuan. Either way, Ma Yuan asserted Chinese power by rounding up all the bronze drums in the land (a symbol of Lac Viet pride) and melted them down and reshaped them into a huge pillar. Yet many of the Lac Viet people hid away their bronze drums, and archeologists to this day still find them occasionally buried or hidden throughout the land. It’s the most ambitious project I’ve yet worked on, and I anticipate it will take me several years to complete. It took me three years to write Joe Harper, and The Bronze Drum will likely be twice the length, and requires just as much if not more research. I absolutely love your idea for The Bronze Drum. What an important symbol it is in the Lac Viet culture, and what an incredible homage to two strong women. These stories are so important, to young girls especially. I actually cite quotations, in my forthcoming novel, from Mark Twain’s Joan of Arc. I decided to use them after reading about a Holocaust survivor, who treasured Twain’s story of feminine strength throughout her ordeal. So I know how important it is to unearth and give life to these stories. You never know who they will sustain. I also love the idea of a sequel to Joe Harper. Please get back to that someday! Finally, to end on a lighter note: You’re a very funny writer. It’s not easy to be funny in prose. I can’t tell you how many times I laughed. Your word play is hilarious. So tell me, if you could sit down to dinner with Twain, what would you discuss? What would you laugh about? Thank you! I put a lot of effort into creating specific effects in my writing, so I consider making my reader laugh to be an accomplishment. It’s a very interesting question what Twain and I would discuss at dinner. I don’t think he would be surprised at all by the extent of his influence on literature, and his permanent place in the American literary canon. But he was notoriously terrible at investing, and had no idea that the telephone (for example) would catch on, and missed the opportunity to invest in it. So I imagine that the technologies of the twenty-first century would be a marvel to him, and completely unexpected and strange. He would probably bemoan the fact that contemporary American society doesn’t value reading, and that those who do read often do so on screens (he had an intimate knowledge of printing and publishing, and loved the artifact of the book). He would certainly take issue with American “adventurism” abroad, as he opposed the U.S. involvement in the Philippines in his own day, and would despair at the casualness with which the U.S. exercises its military power. Samuel Clemens was a complicated man, and was prone to fits of anger and depression in his personal life, despite the comfort and ease and humor with which he represented himself in public life. His autobiography is at times funny, at times quite dark. As far as what we would laugh about, I imagine that it would be transgressive laughter—the kind of laughter that comes from a mutual acknowledgment that one is breaking the rules of polite society. I’d like to get him to hold forth on the subject of Mormons, for example, about whom he said some particularly cruel and funny things. Mostly, I would listen to him talk. His life was so varied and full, I can’t imagine I would have much to teach him other than to update him on the events of the last 100 years, but I would listen absorbedly to Twain talk about even the slightest subject matter. Tara Lynn Masih has won multiple book awards in her role as editor of The Rose Metal Press Field Guide to Writing Flash Fiction and The Chalk Circle: Intercultural Prizewinning Essays. She is author of Where the Dog Star Never Glows: Stories and the forthcoming novel My Real Name Is Hanna. She founded The Best Small Fictions series.